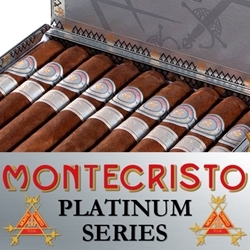 Introduced In 2002, the Montecristo Platinum Series was presented by Altadis USA in response to growing desire for a more full bodied, full flavored cigar. Every Platinum hand-rolled premium cigar is bound with a select Mexican San Andrés Cubano wrapper grown in the legendary San Andres Valley. They are constructed with a rich Dominican binder and a special blend of aged Dominican, Nicaraguan, and Peruvian long filler tobaccos. These exquisite premium cigars offer a rich, smooth and silky smoke each time they light up. Montecristo Platinum cigars are a great addition to every cigar smoker's humidor. Smokers Discounts offers the perfect way to unwind with the Montecristo Premium Series cigars. Try one of the varieties of sizes and flavors listed below. Each of these styles are available today for a discount price at our online cigar store, Smokers Discounts! Montecristo cigars are manufactured and distributed by Altadis USA.